The American Civil Liberties Union wants Durango’s Mercy Regional Medical Center to end its policy regarding anti-abortion practices because, the ACLU said, the policy violates state and federal laws. In a letter sent Wednesday to the state, the ACLU charged that Mercy disciplined a doctor for suggesting a patient’s condition might be fatal if she chose to continue her pregnancy. ACLU lawyer Sara Rich sent the letter to the Colorado Department of Public Health and Environment asking for an investigation of Mercy’s policy against recommending abortions for women with life-threatening conditions. Mercy is owned by Catholic Health Initiatives, and it follows the Ethical and Religious Directives for health care adopted by the U.S. Conference of Catholic Bishops. The directives include a ban on associating with abortion providers. “Mercy Regional’s moral objection to abortion does not exempt the hospital from complying with the laws ... and the hospital cannot invoke its religious status to jeopardize the health and lives of pregnant women seeking medical care,” Rich wrote in her letter. Mercy spokesman David Bruzzese said the hospital is aware of the ACLU’s complaint and is following up directly with the Colorado Department of Public Health and Environment. “We feel the statements made in the complaint are based on inaccurate information and look forward to resolving the issue directly with CDPHE,” Bruzzese wrote in a prepared statement. Mercy is a faith-based hospital, and its employees are committed to carrying out its mission and ministry “in a manner that is consistent with our religious and ethical directives,” he said. The dispute began in early 2012, when Dr. Michael Demos, a Mercy cardiologist, examined a pregnant woman referred to him because of her family history of Marfan syndrome, a disorder of the connective tissue that can cause the aorta to rupture during pregnancy. For women with severe cases of Marfan, pregnancy often is fatal. After an initial examination, according to the letter, Demos told the patient that if her aorta was enlarged past a certain point, medical guidelines would recommend ending the pregnancy. Further tests revealed the unnamed woman did not have Marfan syndrome, and she gave birth successfully. But more than a year later, she complained to hospital leadership that Demos recommended abortion if she was diagnosed with Marfan syndrome, according to the ACLU’s complaint letter. Dr. Kip Boyd, Mercy’s chief medical officer, admonished Demos and told him he is not permitted to recommend or even discuss abortion with a Mercy patient regardless of the circumstances, according to the ACLU’s letter. Mercy declined to comment about specific allegations, saying again that the hospital planned to work directly with the CDPHE regarding the matter. The hospital also declined to release its directive or policy as it relates to abortion and recommending abortion. 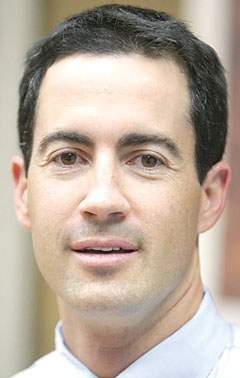 When reached Wednesday night at home, Demos said he has lived in Durango since 2005 and has a vested interest in the community, its people and the hospital. The policy, as communicated by Boyd, encumbers doctors from practicing medicine the way it’s supposed to be, at least in this case, Demos said. “I would like to be able to practice medicine unencumbered by a policy that I don’t consider appropriate or lawful,” Demos said. He questioned whether Boyd made a mistake in interpreting the policy, imposed his own sensibility in the matter or correctly relayed the policy as it exists. Demos said he’s not a crusader; rather, he’s trying to do the best job he can. It’s early in the process, he said. Colorado law forbids hospitals from exercising control over a doctor’s professional judgment, and from interfering with a doctor’s ethical and moral responsibility to his or her patient. The ACLU also contends that Mercy’s policy runs afoul of federal rules that patients be fully informed about their care. “By prohibiting physicians from informing patients of all alternative treatment options, Mercy Regional’s policy violates state and federal law and poses a potential threat to the health, safety and even the lives of Mercy Regional patients,” said Mark Silverstein, ACLU Colorado’s legal director, in a news release. Catholic hospitals have been at the center of controversy regarding mandates in the new federal health-insurance law that employers provide policies that include birth control – something the Catholic Ethical and Religious Directives also forbids. Catholic Health Initiatives runs several hospitals in Colorado, including St. Mary-Corwin in Pueblo, St. Thomas More in Cañon City, Penrose in Colorado Springs and several St. Anthony’s locations in metro Denver. All are governed by guidelines set by church leadership. However, the ACLU complaint is directed specifically at Mercy, not at changing policies at all Colorado Catholic hospitals, Silverstein said in an email.